When you’re fundraising for animals, you want it to be fun for everyone involved. The volunteers and the fundraising participants. Making a splash and getting the local media involved also helps in the fundraising, by drawing attention to your group. Most everyone has heard of the Flocked fundraiser. Where they put a flock of pink flamingos in people’s yards. And then the people can pay like $5-10 to get it removed. Or for $10-20 they can have it removed from their lawn, and pick the next person to be “flocked”. Or for $25 they get protection from ever being “flocked” again. It’s a fun fundraiser that gets the whole community involved. Most people are great sports about it. And it can go on for months, if done right, moving from neighborhood to neighborhood, providing income for the group continuously. To make it into a great fundraiser for an animal shelter or rescue, and to help spread the word about getting pets spayed and neutered to prevent unwanted litters, a few changes are in order. Instead of using pink flamingos, have small 12-18″ cat or dog silhouettes cut out of [amazon_textlink asin=’B000KAH90O’ text=’plywood’ template=’ProductLink’ store=’fosterpack-20′ marketplace=’US’ link_id=’d29f09af-f91b-11e6-be96-6985726d53ae’], attached to [amazon_textlink asin=’B00002NCJD’ text=’stakes’ template=’ProductLink’ store=’fosterpack-20′ marketplace=’US’ link_id=’e2d0648c-f91b-11e6-8343-db30fd54ea01′], and painted with your rescue group’s logo. You’ll probably want at least half a dozen cutouts. And possibly some information about low cost spay and neuter clinics or information. This could even be printed out and then “Modge Podged” on with a [amazon_textlink asin=’B000C011CE’ text=’weather resistant varnish’ template=’ProductLink’ store=’fosterpack-20′ marketplace=’US’ link_id=’f4449fef-f91b-11e6-a82f-11107954f776′]. Have one silhouette that’s slightly larger than the rest, with the fundraiser information, and contact information on it. Or you could put this information on flyers that you tape to their front door. Then start the game. Once the initial supplies, the silhouettes, and possibly flyers are ready, there is very little to do. Just have someone to move the “Unwanted Litter” from place to place, and collect the donations, when the home/business owner calls. Each volunteer can even take a turn doing this. 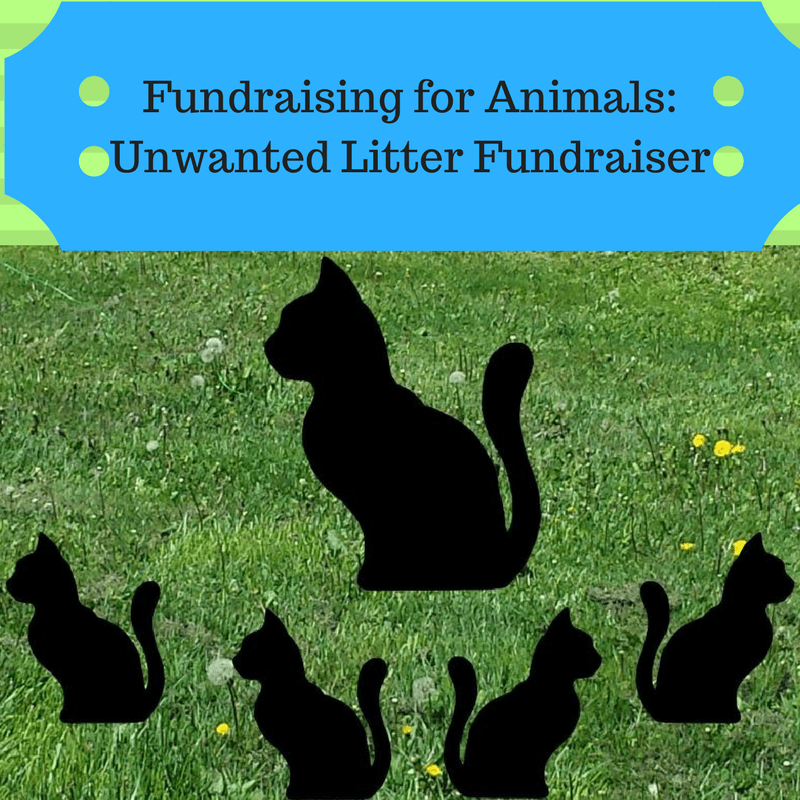 A good place to start with your Unwanted Litter Fundraiser would be the offices of your local newspaper, or TV station. You’d almost be guaranteed some publicity then. And spring, or kitten season, which is coming quickly is a great time to start. Dog Poop – Instead of silhouettes of puppies or kittens, you could do “Dog Poop”, and while fundraising remind people to clean up after their animals. To make the “Dog Poop” to put on the lawns, you could use [amazon_textlink asin=’B00009V3TF’ text=’dryer vent hose’ template=’ProductLink’ store=’fosterpack-20′ marketplace=’US’ link_id=’0a1fb828-f91c-11e6-abd0-33dc033bac19′][amazon_textlink asin=’B00009V3TF’ text=’dryer vent hose’ template=’ProductLink’ store=’fosterpack-20′ marketplace=’US’ link_id=’0aa20772-f91c-11e6-ae33-058e01d2a4ea’], swirled up and painted brown. Put a sign sticking up out of the middle with your group’s logo on it, and the information.